It’s true! Staying *SANE is the easiest thing I’ve ever tried when it comes to controlling what I eat – but even so – sometimes it’s still hard. When I am caught unawares, when I race out the door without eating breakfast, or when my schedule unexpectedly blows up; when I’m in a hurry, when exhaustion strikes, or when the emotional blahs roll in, it can be harder to stay on track. I’ve found that a little bit of planning can make all the difference in the world when your body is screaming for burgers and cupcakes. Or a sandwich. Or a huge bowl of spaghetti carbonara. Or whatever your crush of the moment happens to be. Mine is usually a loaf of Sunmaid Raisin Bread – goodness only knows why. 14 minutes after eating it my stomach feels like a lead balloon, and by the time 23 minutes has ticked by I am lying on the blue leather couch like a beached whale while I slide into a carbohydrate coma that lasts anywhere from 30 minutes to 3 hours. Awful. Just awful. I am getting *much* better at remembering the last “awful” before I cram that first slice in my mouth. It’s also true I have discovered – during my last two run-ins with a loaf of raisin bread – that an ounce of prevention is definitely worth a pound of cure. And here’s a third truth: prevention is only going to happen with a little bit of planning. Here’s what I do to make sure that even when my plans come unravelled, I’m always prepared on the food front – and way less likely to add eating inSANEity to my list of things that went sideways. See if adopting some of these strategies helps you in your quest to stay SANE whatever else is going on. 1. Clear out your cupboards, pantry, ‘fridge and freezer of *inSANE foods. When it comes to meal times at home, it’s much easier to eat *SANE food if that’s all you have in the house. If clearing it all out at once is too daunting, clear out one cupboard, or one pantry shelf a week. Take it to the Food Bank if you cannot bear to toss it out. Eating food that makes you unhealthy “just because you paid for it” does not serve you well. If you have a few favorite inSANE things that you cannot bear to part with (yet), keep them until last. Don’t panic – this does not have to be all or nothing…BUT…just know it will be much easier for you to stay SANE if you make a clean break. If you want to take a slower route to SANEity, take baby steps. 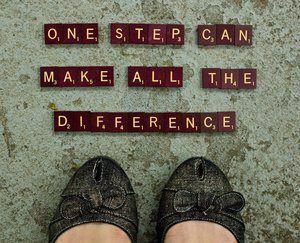 Each step, however small, is a step in the right direction. 2. Fill your cupboards, pantry, ‘fridge and freezer with SANE foods. I will shortly be posting a list of what’s in my pantry that I hope will help you focus when you are next at the grocery store. Keeping these items on hand will make it super simple for you to whip up something SANE at meal times, or when the munchies strike. 3. Talking about the grocery store…when you’re doing the grocery shopping, stick to the perimeter of the store – that’s where almost all the SANE stuff is. Avoid going down any of the aisles in the middle. Depending on the store, the only things I dash into the middle for are herbal tea, nuts, herbs and spices, baking aids such as guar and xanthan gums, baking powder and baking soda, and frozen fruit. 4. Make batches of snack foods to have on hand for when the munchies unexpectedly strike. Here’s 10 great recipes that you can make in advance (and in quantity) to have ready to chow on at a moments notice. Most of them feel very naughty. All of them taste fantastic, totally fill you up and help you towards your health and fat-loss goals. Yep. 5. Make some meals in advance and freeze them – for those days you unexpectedly get home late, or get home so tired you just don’t have the energy to get busy in the kitchen. Instead of going through the drive-thru on your way home, sling a pre-made dish of *SANEity in the oven or microwave when you get home. Soups are particularly brilliant for this. 6. Keep some “instant” protein in the ‘fridge or pantry. My favorites are cooked chicken and turkey slices, smoked salmon or other smoked fish, cooked prawns, canned tuna and salmon, non-fat cottage cheese, non-fat Greek yogurt, hard-boiled eggs. If you get home *really* late and don’t even have the time or energy to scramble an egg, these fill you up faster than anything else, and mean you don’t go to bed hungry, which can be disastrous. 7. Keep these QuestBars bars handy. They are the SANEst protein bars available, and – BONUS! – they taste awesome. Keep a stash in your desk drawer at the office, some at home, a handful in the car, and a couple in your purse / handbag / back-pack / briefcase. Take them with you when you travel – they are a lifesaver at airports and on planes. Most protein bars are not SANE, so be careful. The only other one we recommend is the Pure Protein brand. 8. When you feel hungry – and you suspect it might be emotional hunger rather than physical hunger – drink a glass of water, or drink a cup of green or herbal tea first. If you are still hungry after that, grab a SANE snack from #4 above or a protein bar from #7 above. And then, if you still find yourself in a situation where inSANEity is inevitable, don’t panic! Just do your best in the moment and get back to SANEity as soon as you can. Beating yourself up won’t make anything better. You’re awesome, and you can do this! Liz - clearing out my larder and cupboards truly works! the local soup kitchen LOVED all the Christmas chocs, biscuits and ‘processed’ tins.